Eye-tracking glasses play a role in O’Neal’s real-time paintings. O’Neal’s chickens live in a domed coop of his design. A cart holds sections of rubber frames, which he makes for his paintings. the Saluda Flash carried a mirrored painting down the French Broad River as the reflections on its surface were filmed. The boat, video, and painting were part of an exhibit at Brandeis University in 2003.
visitors to Hanesbrands Theatre in Winston-Salem find themselves reflected in O’Neal’s cymatic mural. The hot air balloon basket in his studio was a birthday present, which he will incorporate into an installation. O’Neal created a polycarbonate dome for The O.V. Project at Little Italy Peninsula Arts Center near Charlotte. Inside, night vision goggles allowed a viewer to observe animals in the dark, but that was just one facet of the interactive experience, which “in the end, all happens in your mind,” O’Neal says. I was concerned I wouldn’t be able to find Jimmy O’neal’s studio, so he met me in Asheville. I followed him on the twisting road north along the French Broad river. We crossed the river, passed the Alexander Baptist Church, and stopped. He got out and removed a padlock on a barricade, and we made our way up to the former Alexander High School gymnasium. Bachelor’s buttons and Queen Anne’s lace grow randomly and brighten the approach, but from the road, the school appears abandoned. It’s just as well. O’Neal says the isolation keeps him focused and the spaciousness of the gymnasium—especially its height—allows him to think and execute big. Inside, there is little order to things. I stepped around a collapsed hot air balloon and wicker passenger basket destined for an upcoming exhibit, as well as clear acrylic and rubber frames for monumental works of art. Scanning the room, there is an electroencephalogram for measuring and capturing brain activity, metalworking and carpentry tools, audio equipment for cymatic creations, cables, gallons of mirror paint, large sheets of acrylic on which he paints, and brushes—lots of artist’s brushes. There are also bins of paintings and stacks of drawings. O’Neal is not set up to receive, but rather to conceive. Here in a quiet corner of Western North Carolina—not New York, L.A., or Paris—he imagines and creates works ranging from paintings that reflect viewers in strokes of mirror paint to an interactive sculpture titled RevolAngels, a vertically revolving climbing wall of sorts that juxtaposes a climber against a scene of falling angels. His work takes on added complexities because O’Neal is part scientist. For example, he invented the reflective paint he uses after discovering it couldn’t be found in stores. Delving deep, he creates art based on brain waves and eye motion. His installations often are kinetic and, on occasion, frenetic. He even entered a national competition to create a solar-assisted car that could travel almost 100 miles on a gallon of fuel. His pieces have been collected by the late Farrah Fawcett, an accomplished artist herself, and Andreas Bechtler, namesake of the Bechtler Museum of Modern Art in Charlotte. His work hasn’t been exhibited locally because of long-standing relationships with galleries in Atlanta and Los Angeles, but he will soon offer works from his studio. A recent work commissioned by The Arts Council of Winston-Salem and Forsyth County is based on cymatics, the science of capturing sound and resonance in a space, and translating them into a visual work. In typical fashion, when he found the collection mechanism too expensive for his liking, O’Neal built his own. He collected sounds, frequencies, and resonance and directed them to a metal plate holding water. The liquid shifted and formed patterns as the sound vibrations passed through the plate. O’Neal photographed the patterns, and selected one to be painted in the lobby of the new Hanesbrands Theatre. 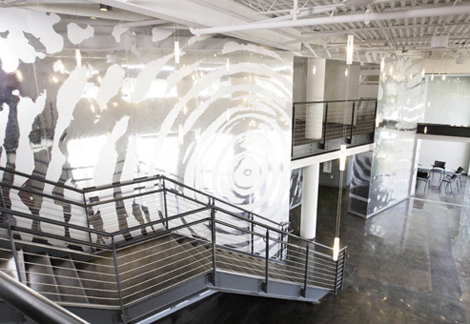 The result was dramatic swirls and irregular lines that seem to echo across an expansive wall. O’Neal says, “I wanted to create a mirrored, sculptured mural in an active environment where visitors become a part of the artwork through the reflection of their own images, the colors of the clothes they are wearing, their jewelry, and their random, unconscious movements.” In effect, the mural will never be the same during any two seconds of its existence. Making his complex pieces happen can be a multistage evolution, as was the case in a large show prepared for The Rose Art Museum at Brandeis University in Massachusetts. O’Neal decided to capture the constantly changing, interactive nature of his reflective work by using the energy and beauty of the French Broad. He sat and, one-by-one, observed the paintings he had done for the exhibit while recording his brain waves. Each was translated and drawn in mirrored paint to create a single work. He mounted the painting to an airboat and floated it down river past Marshall while filming it picking up reflections and images from the water and shore. “Marshall is a small town, and word got out quickly about what I was going to do,” says O’Neal. “I had the feeling as we floated down the river, there were a lot of eyes watching us from the riverbank.” The painting, video, and craft all became part of the exhibit. He grew up in the Atlanta area and in his words, “I was a, ‘Yes, sir,’ ‘No, sir,’ kind of kid. I was always good.” He made As in chemistry, loved music and theater, and even as a small child salvaged cardboard boxes and painted on them in the basement space he claimed as his own. “I suppose you could say that I am a polite person without boundaries,” he says. These paintings launched his career while he was still a teenager. It was like a scene straight from a Zach Galifianakis movie: O’Neal was visiting an Atlanta gallery when management mistook him for an artist trying to place his work. They asked if he had slides and by chance he did. He sat bemused through an interview that he didn’t know was an interview only to have the owners of this major gallery offer him a show on the spot. Suddenly he was Jimmy O’Neal, “serious” artist and a figure in the art world. He sold most of the 27 pieces in the exhibit. O’Neal was an accomplished musician and stayed in Savannah after graduation for a couple of years to perform with a band. The group signed with a record label, but O’Neal decided to be an artist. “I’ve never had another job since,” he says. He returned to graduate school at SCAD and his natural tendency to stretch boundaries again emerged. With fellow students, he plotted to get into the Guinness Book of Records by creating the world’s largest painting—a slightly obscene portrait of Elvis the size of two football fields. Media swarmed the site and filmed it from the air, prompting embarrassed college administrators to confiscate and trash the piece. In 2001, O’Neal made his way to the mountains via Charlotte, and a building on Main Street in Marshall became his home. A balcony gave him a view of the French Broad and sparked the idea of floating his painting down river. O’Neal kept things interesting in Marshall. On one occasion his young son, Iris, not understanding the usual order of things, bemoaned the fact that he didn’t get to attend his parents’ wedding. Jimmy and wife, Erin, decided to make him happy. Each Wednesday afternoon for several weeks, they got married again. Some were theme weddings with costumes, and friends and neighbors were invited to participate. Iris was delighted. One event turned into a hilarious, raucous pie fight. About a year ago, Jimmy, Erin, and sons, Iris and MezzMyrh, and daughter, PINATOVA, moved into a geodesic dome in Buncombe County. Still a family of free spirits, they raise chickens that live in a home of his design, a low frequency dome made of recycled materials. He’d eventually like to have some goats. The family manages well, O’Neal says, without the bane of television. As we toured the studio, I told O’Neal I felt the phrase avant garde was too dated to describe his work, and asked him to give me a word to describe himself. He pondered a bit, then said, “maximalist.” The meaning: a person who favors direct or revolutionary action to achieve a goal. I thought about that definition and how it may relate to a privately commissioned work he recently completed—a birthday present for a wife and mother. Her husband and kids spent a day with O’Neal at his studio. He constructed an enclosure, and the father and one child got inside and told jokes. The second child, who sat outside and watched wearing eye-tracking glasses, would declare who had told the best joke, and the loser got a pie in the face. Then the children switched positions. As the child outside watched, his or her eye movements were charted by O’Neal, who then created a real-time painting from this unique experience. The picture was framed and hung in the foyer of the family’s home, and a monitor was installed beside it so viewers can watch the joke telling, pie throwing, and the creation of the picture. O’Neal is always looking to the future. He has in mind a project to transform an iconic building in downtown Atlanta—one that was built the year he was born—into a gigantic passion flower that will be activated through voice cymatics and the wind. But he can be even more esoteric and talk about new adventures in the realm of the human mind.